從台灣本島到蘭嶼有搭飛機以及搭船兩種方式. 飛機的話目前只有台東機場有德安航空到蘭嶼的航班, 其他地方沒有.搭船的選擇就比較多了, 台東富岡有, 也可以從屏東後壁. 如果說旅程規劃沒有任何彈性, 事情就簡單許多, 但是選擇也相對變少. 比如說就是要從台北到蘭嶼, 然後日期就是 8/1 到 8/4, 那麼大約只剩下台北搭火車夜車到台東, 一早坐飛機到蘭嶼, 不過這樣的旅程很累 ; 或是 8/1 早上搭火車, 但是這樣到蘭嶼的時間就變成下午了. 而如果旅程規劃有很多彈性, 像是我們的規劃, 可以接受先到台東住一兩天, 然後從容地搭飛機到蘭嶼 ; 甚至可以接受先到台南待一天, 然後從台南搭火車到台東 (大約只要三個半小時), 這樣比台北到台東快上不少, 旅程也比較不會累. 其他像是先到花蓮, 再到台東等等, 都在可以接受的範圍. 這時候再考量旅館, 交通, 食物等等相關事項, 整個規劃作業瞬間就變的很複雜. 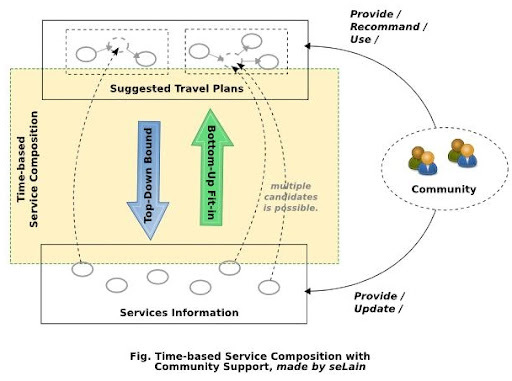 在 Web Service 與 SOA 的研究中常見以 Traveling 作為 Service & Workflow 的 Example. 常見以 Time 為根據作行程的銜接, 以及基本的條件設定, 然後加上一些進階條件的選擇, 像是不搭船, 以及 Quality 的要求等等. 這樣 SOA 的 Solution 事實上存在很多複雜度, 除了上面說的以外, 像是 Service 的狀態要能由 Service Provider 更新, 確保 Service Abailability 以及 Quality 等等. 但是若單純以 Bottom-Up 的方式去產生可能的 Workflow, 固然可以得到最多的可能性, 但是畢竟使用者要的通常只有一兩個, 因此中間就需要透過使用者的參與來降低可能的選擇數目, 這又變成了 User Interaction 的問題. 也許因為這樣的複雜度, 許多國內的旅遊服務都只停留在 Information Portal 或是 Service Portal 的階段而已, 而不是真正的 Service Provision Forge. 我認為類似的應用應該考慮利用 Top-Down 以及 User Community 來夾出可能的選擇, 進而大幅降低一般使用者的負擔, 同時確保規劃結果的品質與可行性. 方法就是利用現成的 Travel Plan 作為 Incomplete Workflow 去套可得的 Services. 可以想像一個類似 Digg 的 Travel Plan 推薦子系統, 由一個 Community 維護. Community 成員可以貢獻自己的 Travel Plan, 作為基本的 Template, 而其他成員是以一個 Travel Plan 為單位進行推薦以及參考. 而反過來, Community 也能夠提供 Single Service 的資訊, 有利於一般 Service 資訊的更新與正確性. 當然, 免不了地 User Interface 依舊會是關鍵, 必須要能夠盡量降低使用者輸入以及推薦 Travel Plan 的 Effort, 才能夠在使用者可以得到的幫助與付出之間取得平衡. 另外必須有 Formal Travel Model, 而不是向許多旅遊網站只是讓使用者以 Natural Language + Free Style 分享旅遊心得. 既然要從使用者端取得資訊來再利用, 就應該有系統地蒐集以及使用. 不用把資訊的取得想的太複雜, 也不要期望旅途中相關的商家旅館會時時更新訊息, 單純依靠 Community 的力量來建構這樣的環境, 有效地在資訊進來之前就先篩選, 同時也讓回給使用者的規劃有最高的有效性. This entry was posted on 上午10:00 and is filed under idea , service oriented computing , web engineering . You can follow any responses to this entry through the RSS 2.0 feed. You can leave a response, or trackback from your own site.